By now, the February 19 incident involving 18-year-old gunman Sulejman Talovic, who opened fire in a Salt Lake City mall, killing five people and wounding four, has become alarmingly familiar, one in a growing number of active shooter incidents in the U.S.
At the heart of this incident is Master Officer Kenneth Hammond, 33, of the Ogden, Utah Police Department. Ken was off-duty that night enjoying a Valentine’s Day dinner at a mall restaurant with his pregnant wife, Sarita. Little did he know the events of that evening would thrust him both into the line of fire and the national media limelight, standing as a heroic example of the extraordinary risks officers take—even off-duty—to keep the public safe. In an exclusive interview with PoliceOne.com, Ken shared his first-hand account of the incident, revealing his off-duty survival tactics—each thought, instinct, and action—that saved countless lives that night. His experience stands as a real-life reminder that at anytime, in any location you may be called into action, so be sure you’re trained and ready. In his six years with Ogden PD, Ken had never been involved in a shooting. Still, he was disciplined about carrying an off-duty weapon, a .45-caliber handgun that he keeps just outside his belt in a pancake holster concealed by his shirt. The night of February 19th was no exception. Before heading out with his wife for dinner and an overnight stay at a local bed and breakfast, he holstered his Kimber .45 and set out wearing jeans and a long-sleeved shirt. After dinner, the couple left the second-floor restaurant into the main two-floor mall thinking they’d buy a Valentine’s Day present for Ken’s three-year-old son from a previous marriage. When they paused for a rest they heard a “popping” sound, which they assumed was coming from construction work in the mall. Aside from that noise, which Ken says didn’t raise suspicions of trouble, the mall was quiet. As they continued into the main portion of the mall, they heard the popping sound again. “I made a comment to my wife that the noise was bothering me, and they needed to quit doing that because it was so loud,” Ken told PoliceOne. But aside from that, Ken didn’t hear anything out-of-the-ordinary… nothing that would clue him and his wife into the nightmare scenario unfolding below them; a much different atmosphere than the stereotypic active shooter scenario. It was when he looked over a rail to the first floor when the reality of the moment set in. Below he saw “numerous people,” who were badly injured, lying on their stomachs, their backs, and a few sitting up. At first glance, Ken couldn’t tell the extent of the injuries or the full gravity of the situation, but he could “tell it was bad.” As he scanned the scene he spotted a man walking out of a store armed with a black shotgun…an active shooter in full combat mode. Reflexively, Ken drew his gun and began yelling to the people around him on the second floor, ‘Off-duty OPD! Off-duty OPD! Get down, get down!’” With his gun in his right strong hand, he decided not to risk reholstering or transitioning to his weak hand in order to grab the off-duty ID in his right back pocket, so he continued to shout to identify himself as an officer. “I went from being on a date with my wife to ‘police officer in work mode’ in the snap of a finger.” Ken told PoliceOne. Kenneth Hammond was the recipient of THE FORCE 2007 Postitive Force Award. 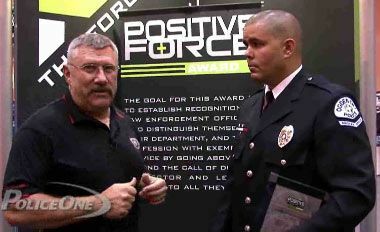 Here, he talks to P1's Dave Smith at the 2007 IACP Conference & Expo in New Orleans. He gave Sarita a slight push and said, ‘Go! Secure the restaurant, call 911!’” There was no hesitation, no discussion. Sarita has been a police dispatcher for nearly five years; she knew what questions they’d ask. Back in the restaurant, Sarita borrowed a waiter’s cell phone to call 911. Calm and instructional, she relayed the critical information: “My husband is an off-duty officer, not a second gunman. He is actively engaging the suspect.” She gave a physical description and told them what he was wearing. Meanwhile, Ken had the suspect’s full attention. From the lower level, the gunman had turned to face him and was now firing. Ken ran around to the left side of the upper tier while the gunman continued to target him. Ken didn’t know the mall layout, but he knew there were escalators behind him that the gunman could go up. He needed a better vantage point to track the gunman’s moves and had to stand up to get it. He could see that there were some civilians on the other side watching the suspect from an opposite tier. One man, who could apparently see the gunman, motioned a location to Ken. In a flash of what Ken now calls intuition, it was clear that Oblad believed him. Ken indicated to Oblad that he was coming down, then jumped on an escalator situated behind the uniformed officer that faced away from the suspect, giving him cover. When he got to the bottom, he positioned himself behind Oblad, who was wearing a vest. Ken religiously wears a vest on duty as well and says that not having one was an obvious consideration. “It was in the back of mind, there is nothing to protect me,” he said. Ken peeked his head up around the sergeant in order to keep his eyes on the gunman. Right then—POP! POP! POP!—the suspect drew down on the two officers and fired. 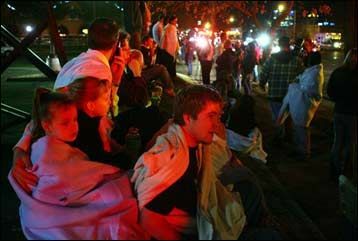 “I moved back toward the center of the mall and took cover behind a very large concrete and brick pillar. It was good cover because it was wider than I was,” said Ken. He now had a clear line of vision to the gunman and fired at him. Due to pending investigation, Ken cannot disclose how many rounds he fired, but he did share that his limited cache of ammo was a point of concern. After a five-second pause Ken heard the sound of automatic and semi-automatic gunfire. SWAT was inside the building. As SWAT cuffed the suspect, Ken and Oblad knew it was safe to approach. “At that point it was pretty much over,” he says. Ken’s best guess is that the entire episode lasted three minutes. A three-minute bloodbath. Five people murdered: Two men, two women and a 15-year-old girl. Four others critically wounded. Ken has been rightfully hailed as a hero for his quick action and willingness to draw fire away from the innocent people in the mall. “From the amount of times he fired at me, I feel that I definitely drew his attention, and just gave SLCPD the opportunity to go in and solve the problem,” he said. Given the fact this was his first shooting incident—an active shooter rampage at that—was he surprised at how “on” he was, how instinctive his tactics were while off-duty?